Your business has probably heard that QuickBooks is a great tool for printing checks conveniently and securely, but hasn't started to print checks yet. 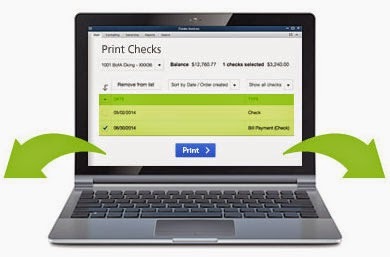 The following tips can help you print checks smoothly using the QuickBooks platform. Once you start printing your own checks, you'll never want to go back to preprinted check stock again. QuickBooks "offers a few options for check creation." (1) With QuickBooks check printing, businesses can specify options for the write-check function of the program. The ability to customize checks is a great feature that has attracted many businesses to the QuickBooks program. The QuickBooks check-writing function "integrates easily with your QuickBooks accounting information" (2) for seamless transacting. Quickbooks allows users to easily customize their business checks. Choose from options like standard or wallet style to create paychecks, for instance. Quickbooks allows you to change fonts when allowed (items like routing numbers must use fonts required by banks) and even to add the company's logo. Did You Remember the Security Ink? If you begin printing your batch of checks but realize you made an error such as forgetting to change your ink cartridge to the secure ink cartridge, all you need to do is press the "escape" key and QuickBooks will immediately halt the operation so you don't waste more paper than you'd prefer. QuickBooks allows businesses to conveniently print batches of checks. Of course, you will need to make sure that you accurately assign check numbers to your printing, but the overall operation is simple. Like any program, QuickBooks becomes easier to use for check printing when you take time to get to know the ins and outs and use the program on a regular basis. Allow your accounting department or accounting manager to have time to train on the program so that they can become an expert. The program has come a long way and that's one reason why so many businesses prefer it. Its functionality is tried and true. Adopt QuickBooks for check printing and you'll see why so many other businesses have too.